Think about it Russia is going through a similar state that the United States went through in 1980, sky high inflation, high government expenditures and war (the United States I believe was in War with the Soviets in Afghanistan and the United States was in war with the Soviets in the Cold War). Also US productivity growth was not the highest in 1980 because we were just about to be on the cusp of the Technology Revolution, whereby the Russians are in an oil problem right now so they have not low productivity but big problems (low productivity growth is a big problem. But in the 1980s when the US had 15%+ interest rates did they come out on top and was that (the bond market) a really good fixed investment, yes! Also sanctions because of the war with Ukraine have caused Russias USD (US Dollar) position to begin to go down. The Russians are having to use there public pension fund money to backstop the currency system by using some of the money to fund the banks in Russia. This is all not a sustainable path and the Russian government needs $70 dollar oil. But lets step back for a second. The Russians have $420 billion reserves (link: http://cbr.ru/eng/hd_base/default.aspx?Prtid=mrrf_m ) and they have a resource rich country. They have low government debt (as much as 1/5th) as the US in a percentage terms of the economy, the US is 100% debt to GDP, the Russians are like 20%. So is there a prospect of Russian bond default? No of course not, they have a lot of Cash and Assets and low debt. Does this mean though that the Russian rouble will stay weakened for a time, probably but will the price of oil eventually go back up? YES of course, we are going to need oil for a long time to come, Tesla (TSLA) is not going to solve the oil problem anytime soon. 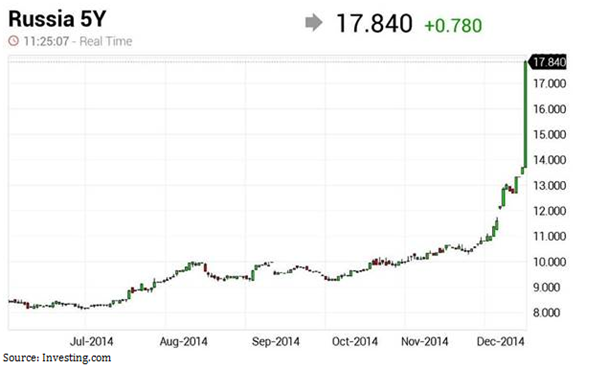 Is there a chance the Russian Ruble will weaken and there will be some currency loss to your investment? Yes but will you come out better in 10 years if your in a Russian 10 year bond, probably.